Enigma, a mixed media light installation by Dorothy Tanner. Tanner heads the team of four artists who live in community and comprise Lumonics. “Living together, the art is always in the air,” said Barry Raphael, the Lumonics archivist and publicist. Tanner’s trio of collaborators are young enough to be her children. The small art tribe assists her increasingly in her process as her eyesight and hearing fail. “She’s an inspiration to all of us,” said Barbara Ungar, who manages Lumonics’ bookkeeping and assists Billard in the studio. Dorothy Tanner's Yess + Love = Bliss installed at the McNichols Civic Center Building. Mel Tanner's Color Vapors installed at the McNichols Civic Center Building. Enigma and Y Not by Dorothy Tanner. Light Spaces (left) by Mel Tanner and My Girlfriend (right) by Dorothy Tanner. Transition (left) by Mel Tanner, and Dorothy Tanner's Triad (right). The Lumonics got their name from a member of MENSA, a fan who coined the portmanteau blending the prefix “lumo” for “light” and the suffix “onics” from “harmonics.” Lumonics originated in 1969, when Mel Tanner started making light sculptures. 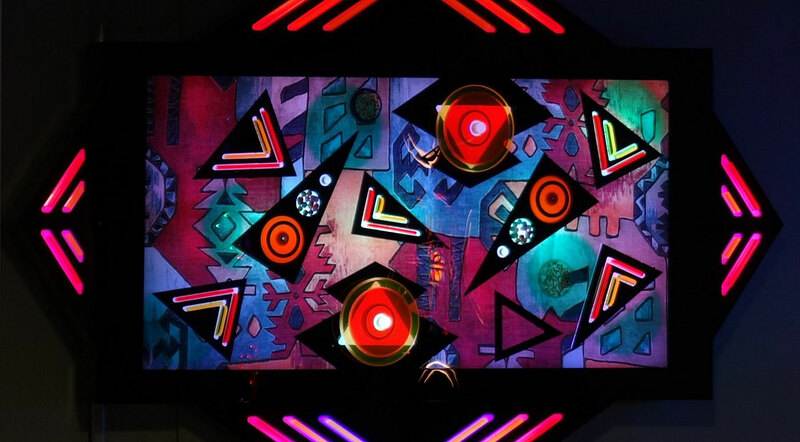 Dorothy Tanner took a more active Lumonics role after her husband’s death 25 years ago, and continued the use of color, light and sound to create various vibrations that set moods. While some installations are uptempo dance parties, the Mind Spa is more meditative. Jomar Suarez, MD is a board-certified psychiatrist who has collaborated with Lumonics. He plans to conduct medical studies on therapeutic effects of Lumonics art. “Through the years—over five decades now—people have commonly reported to Dorothy Tanner having profound spiritual and emotional experiences while contemplating her Lumonics pieces. Lumonics is exerting its effect by creating an immersive experience that feels safe and soothing, but also stimulating and expansive,” Suarez said. “Lumonics pieces seem to have a harmonizing effect over the limbic system, allowing for better synchronization with the prefrontal cortex and likely resulting in the creation of novel neural pathways,” said the psychiatrist, who added that the effect could treat depression and post-traumatic stress disorder (PTSD). Even the most well-balanced people benefit from a visit to the Mind Spa. The Lumonics oeuvre includes hundreds of light sculptures. Typically known for freestanding sculptures, this exhibit includes all wall-mounted pieces. The show spotlights the most recent Script Series, including a piece animated in the manner of a nostalgic neon sign spelling out “Yess + Love = Bliss.” Both playful and dead serious, the sculpture could serve as Tanner’s current artist statement. The Lumonics light sculptures start with an industrial material: Plexiglass. The Plexiglass palette includes at least 100 colors. The material varies from transparent to translucent, fluorescent to opaque textures. The other element of design is light. The LED lights in the Mind Spa are so vibrant they’re juicy, a visual elixir, a spiritual refreshment. Tanner ranks as a luminary in an art form not as well explored as other media. In his review of Tanner’s 2017 retrospective at Museum of Outdoor Arts in Englewood, Colorado, the artist Todd Siler put the work in context in terms of the larger art world. Siler wrote, “While gazing at these beautifully crafted and illuminated constructions, I time-traveled to the 1970s to 1990s when other innovative artist were exploring new media and aesthetic experiences: sculpting light (James Turrell, Keith Sonnier, Bill Parker); shaping sound (Christopher Janney, Paul Earls); moving us emotionally conceptually, spiritually with transcendent lightworks (Gyorgy Kepes); creating visionary works of elemental art (Otto Piene); and melding symbolic lights in immersive theater using virtual reality (Tod Machover). “Lumonics Mind Spa” has been extended to June 16 so the gallery can be featured during the Americans for the Arts Conference in Denver. Numerous events are planned in conjunction with the exhibition. Tanner encourages people of all ages to step into “Mind Spa” to experience present moments surrounded by the presence of healing color, light and sound.